Perfect for home, office and business needs. This sign is made of the highest quality aluminum for a weather resistant finish. It's lightweight and durable. 9" x 12" TIN SIGN WITH PRE-DRILLED HOLES FOR EASY HANGING. 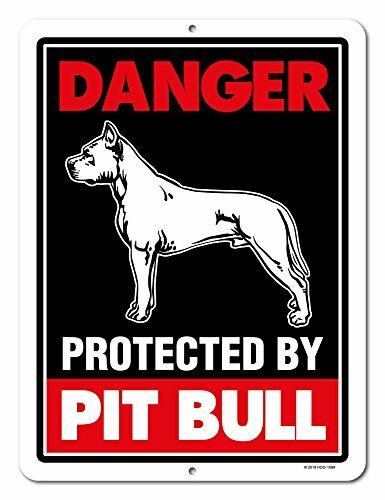 This sign simply reads, "Danger Protected By Pitbull"
If you have any questions about this product by Honey Dew Gifts, contact us by completing and submitting the form below. If you are looking for a specif part number, please include it with your message. 25 Pack of Blank Yard Signs - Made with Tear-Proof 18x24 Inch Coroplast - Heavy Duty H-Stakes Included - Great for Promoting Your Business, Open House, For Rent, Garage Sale, Elections, and Birthdays! 10 Pack of Blank Yard Signs - Made with Tear-Proof 18x24 Inch Coroplast - Heavy Duty H-Stakes Included - Great for Promoting Your Business, Open House, For Rent, Garage Sale, Elections, and Birthdays!